The New Year is Perfect Time to Start a New Commute! We made it to 2018! What a big year 2017 was, what with the opening of the Redmond Connector and SR 520 pedestrian/cyclist trails, a successful Tour de Redmond, and a GRTMA team that doubled in size to bring you your best commute option resources. Here’s the thing- it’s easy to make excuses. Whether it’s pledging to workout every single day, remove favorite foods from your diet or some other extreme change to your life, we make resolutions to break them. Your commute doesn’t have to be that way. Make a resolution you can keep. It would be amazing if we could ride the bus, every day and every time or be so lucky to walk to work. But what if you resolve to try to make just one smart trip per week. Ride the bus one time each week. Share the ride one time. Work with you employer to telecommute one day each week. Did you know that there are all sorts of incentives for choosing to commute smarter? First off, it’s easier than ever to get a FREE $25 ORCA starter card. You’ll be saving money and the environment. Every time you log 4 smart trips on GoRedmond.com, you are entered to win a prize! Drawings range from REI & Starbucks giftcards to money for Uber Eats! 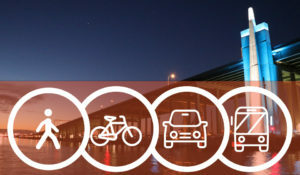 Basically, make your one smart commute a week, log it on your calendar, save money by not driving and maybe win a prize! That’s it. We know it’s daunting to ditch the car, but with GRTMA and our partners at Go Redmond we have everything you need to start 2018 off right. Just try one trip per week, or even on per month, just to try it out. Make 2018 the year you get out of your car and #GoGREATER.